Previous intra-abdominal operation may have only trivial impact on the performance of a subsequent laparoscopic procedure or may render laparoscopy not only unwise, but impossible. This wide spectrum of influence is related to the substantial variation in patients’ tendencies to form postoperative adhesions. 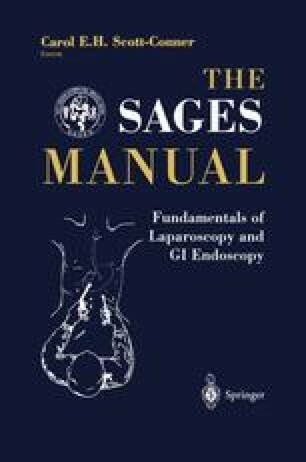 The laparoscopic surgeon should not be intimidated by the potential difficulties posed by such adhesions, but should approach the circumstances with an awareness of the strategies and tactics that have been utilized routinely and successfully during decades of traditional (open) operations. The influence of previous abdominal incision on choice of access for induction of pneumoperitoneum was discussed briefly in Chapter 4, and is considered more fully here.